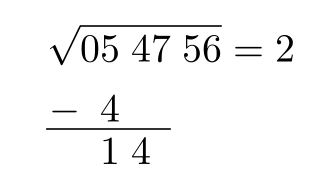 Now after the "1" there should appear again a "4", exactly beneath the "4" of the very first line. How can I do this? 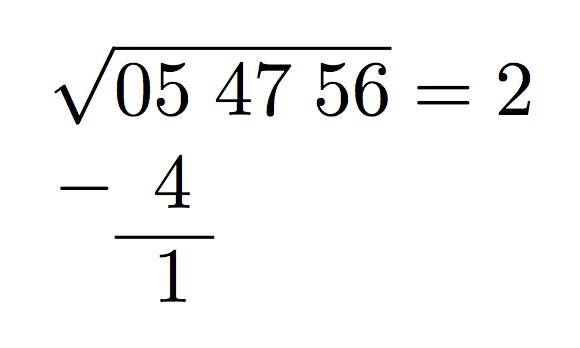 Is there a more elegant solution in general (so that question 1 can be solved more easily)? You can use \mathmakebox and array. In the first column, the radical is placed as if it had the width of the radical sign (and no vinculum). TikZ: How to center a label's text of a node when using label=? How can Text be vertically centered, but horizontally aligned to the right?